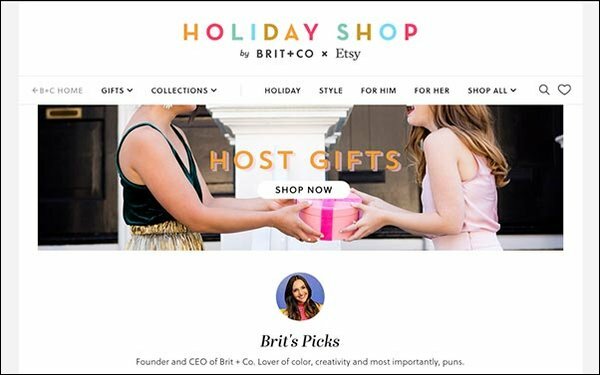 Brit + Co today launched a curated online store with gifts for the holidays, in partnership with online marketplace Etsy. Hosted on Brit + Co’s site, the shop features over 1,000 items curated from Etsy, a platform that allows independent creators to sell their wares. The site utilizes a shopping tool created for Brit.co. Once a shopper finds something they like through the Brit + Co store, the link to purchase takes them to the item on Etsy, where they can buy the product. The Etsyitems range across a number of themes, personalities and price points. Gifts can be found for “That Hygge Life” and “Plant Lady,” as well as personas like “Creative,” “Techie,” “Hostess,” “Food” and “Fashionista,” among others. Home goods and decor products are for sale, as well as jewelry, soaps, treats, phone cases and personalized gifts, such as custom family portraits and monogrammed passport holders. Brit + Co, a media company founded by CEO Brit Morin, appeals to millennial women with DIY and lifestyle content. It claims to reach an audience of more than 125 million women who are higher-than-average converting shoppers. Etsy has a community of 2 million creators, with over 45 million items. The holiday shop will be up through January. Last month, Brit + Co’s annual #CreateGood event series partnered with Oath’s live Build Series to reach a wider audience on its online platforms, including AOL, HuffPost, Makers and Yahoo. The five-day event was live-streamed from the Build Series studios in New York City.